I’m happy announce I’ve just released my first plugin to the WordPress repository. After years of using WordPress I’ve finally developed my skills enough AND found the need to which no better solution had already been created. Think Up! Testimonials is a light weight testimonial rotator for small businesses and individuals to use on their site. There are a lot of testimonial plugins out there but nothing properly fit the situation which I run into regularly working with small business. Businesses need to show their cred! And to do so, sharing how people have benefited from their product or service is a great way to introduce a business to a greater audience and gain trust. Many of the testimonial plugins out there use WordPress custom post types which makes things relatively easy; you make a testimonial ‘post’ for each testimonial you have and then output them into the site. The main problem with this, is that it’s just overkill. With all the plugins out there using custom post types for e-commnerce products, events, portfolio items etc.. you can suddenly have a messy WP admin and putting each testimonial into a post format is just plain more work than is needed. So to keep it simple I used a format I saw first used by Mike McAlister over at Array Themes. Mike does incredible work and he didn’t see the need to re-invent the wheel for testimonials, so he just used a custom sidebar and WordPress’ native text widgets. Since then, I always thought that was such a elegant and simple solution that when determining how to approach this outside of Mike’s Slate theme that I would definitely want to riff on his wisdom. When the Think Up! Testimonials plugin is activated, it creates a sidebar called ‘Think Up! Testimonials’ which then becomes available in your Widgets area. Grab the native WordPress text widget and drag it into the newly created sidebar. Leave the title blank and then paste in this simple markup. Simple text widget with markup stored in Think Up! Testimonials sidebar. 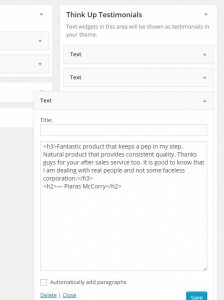 Edit the markup and replace the default text with your testimonial content and the author’s name and/or initials. Then add as many text widgets as you want, repeating that process until your done. to your themes template files. Often, people will want these on their homepage template, the contact page, or some other part of the site where business can benefit from showing what others think of them. to set the time delay for 8 seconds on each testimonial. I’ve had a blast releasing this and getting to know the WordPress SVN (developers version control system) so I hope there are others out there that can benefit from it. If you find it helpful, please leave a review on the plugin on the WordPress repository. The demand of testimonial plugin is increasing day by day as this plugin creates the scope to represent the feed back from customer on the products activities . Only a perfect testimonial plugin can assign the testimonial nicely on the site . However this is one of the best testimonial plugins hopefully . Samdani, Thanks for your feedback. It seems like you’ve developed a powerful testimonial plugin yourself. Great work! I’ve plugins like yours in the past, but in most cases I find I want a simpler solution, something that just works, doesn’t add clutter and new post types to the dashboard and is easy to setup, so I came up with this. Hopefully others will find it helpful as well. Had download and try on with the testimonial plugin from think up. A great and simple plugin for wordpress theme. It can easily show up the testimonial at the show case page at our website. Hope can get the update to date plugin in store.